This DIY set gets you started on nut milks with four creamy combos. Just add water and blend! Moo-free milk has moved onto grocery store shelves, big time. But the store-bought stuff is weak sauce, compared to the rich, creamy sweetness of homemade nut milk. This DIY set gets you experimenting successfully with scrumptious, healthy nut and grain milk blends without having to do hours of research and shopping beforehand. Yum! The set of four well-balanced blends includes four different scrumptiously sweetened combinations. Simply add water and blend to make several velvety servings worth (about four cups of each blend) for drinking, coffee or tea, cereal, baking and cooking, etc. 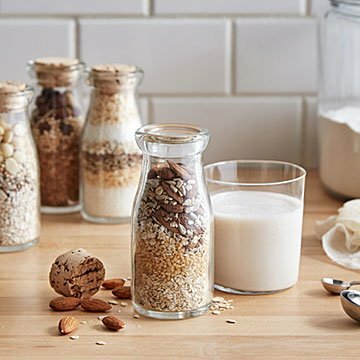 The carefully selected ingredients are layered in the clear bottles so you can see exactly what's inside (wholesome nuts and grains) —and what's not (artificial flavors, additives, and thickeners). Made in Montreal, Canada. I love that the set comes with everything you need. You just add water. The item requires a blender. I purchased this set after my mom had ordered one for my aunt for her birthday. I never even heard of a kit like this. It is worth every penny. I've used up the coconut + almond bottles and I love the concept that it's fresh and organic ingredients. I really like these milks in coffee as a little treat. Would recommend and buy again.